Secretary and three At-Large positions. This year’s Annual Membership Meeting will take place on Monday, November 12 at 6:00pm. This year’s meeting will be held at Good Shepherd Presbyterian Church located on Rea Road. At this meeting the membership will be electing 5 board members. Members have 1 vote per family. The positions up for re-election this year are President, Secretary and three at-large positions (socials, men’s tennis representative and marketing). Current board members, Todd Leahy is running for President, Secretary is an open position, at-large socials is an open position, Barry Reeves at-large marketing, and men’s tennis representative Mike Waleski are running again. Four of the board nominees of the five openings are running unopposed. The nominating committee approved the following below applicants. Board officers’ will serve a two-year term, attend monthly meetings and have a membership dues benefit after serving one year. Please plan to attend this informational meeting on November 12 and elect this year’s Board of Directors. Click the link to vote Windyrush Board Voting. Todd Leahy, wife Jen and daughters Anna (13) and Claire (10) have been members of Windyrush since 2014. They have lived in Charlotte since 2001. He is a fundraiser for United Way. Todd served as Treasurer on the Windyrush Board prior to serving as the current President. Their daughters are into several activities including volleyball, swimming and drama! Their family club interests are to cheer on the girls as they enjoy being Dolphin swimmers. They attend as many Windyrush socials as they can. They have not tried tennis yet…. that is a 2019 goal! Leigh and her husband Kevin, have a son Chase (9), and a daughter Simmons (6). Leigh is a native Charlottean. She is employed as a Dental Hygienist with Drs. Markham and Hair. She and her family have been members for 5 years. Leigh enjoys spending time with family and friends, exercising, traveling, camping, hiking, cooking, and tennis. Her club interests are swim team, attend all the socials, attend some of the tennis socials, USTA member, and summer tennis camps for the kids. Goals for the coming year (both as a member and outside of the club) are to spend more time playing tennis, doing some home improvements, and spending more time volunteering at OP. Erica and her husband Michael have a daughter Eliana (11) and a son Rocco (8). Her hometown is Indianapolis, IN. Erica is currently a stay-at-home mom, previously she was a Marketing Manager for the Indianapolis Museum of Art. She and her family have been Windyrush members for 1 year. They joined last spring when they moved to Charlotte. Her hobbies and interests are swimming, running, camping/traveling and reading. One child swam for our WR dolphins swim team this past summer, the other was on the dive team. They enjoy the social events and recreational tennis. As a family, they hope to meet more members in the coming year and become more involved in the Windyrush community. So far they have found Charlotte and the Windyrush community to be very welcoming! 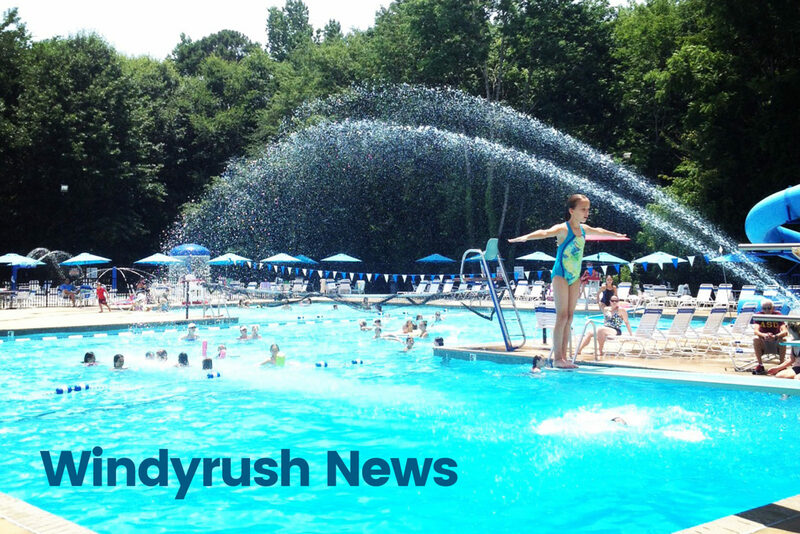 Having grown up with a "neighborhood" pool, Windyrush felt very familiar and comfortable. Applying for the Board seemed like a great way to dive in and get involved in our community. The position of secretary seemed like a natural fit for her skill set. With a past career as a marketing manager, experience chairing several committees during her long tenure in the Junior League (Indianapolis & Ann Arbor chapters), and now managing their household full time, Erica is good at keeping things organized and keeping people on task. She also prides herself on communication, both in-person and outside of meetings, recognizing people's time is valuable. Personally, in the spring she is planning to do some tennis clinics at Windyrush and maybe one day get good enough to join one of the women's leagues. Both children enjoyed the swim/dive team and are looking forward to participating in the coming season. Being still relatively new to Charlotte, Erica is excited to continue discovering and settling into Charlotte. Barry Reeves and Jenn plus Addison (14), Camden (14) and Colin (14) have been members for 7+ years. Originally from Mayfield, Ky., Barry is a Broker/Realtor with Keller Williams SouthPark. His hobbies and interests are hiking, whitewater rafting, live music, hitting The Lodge for great craft beers and loaded nachos, golfing, grilling out, home remodeling and, of course, rooting on the Panthers, Kentucky basketball and the St. Louis Cardinals! Their family life revolves around the pool in the summer. The kids love every second splashing and diving and playing, all the while Jenn and Barry hang out on the deck, sharing beers and stories with friends and neighbors. Colin has gotten into tennis big time, and when Barry’s knees and ankles allow (what can he say, he’s an old baseball catcher), he enjoys matches with him, too. Barry is so proud to have helped Windyrush achieve its four strongest membership levels EVER and to achieve capacity – with a long waiting list, to boot -- for the first time in Windyrush history, further strengthening the club’s financial status and giving us the ability to further improve on our most favorite place in Charlotte. … Outside of the club, his personal goals are to continue to help his children grow into amazing young adults (they’re your future life guards, you know) and in business continue to help families achieve their goals in real estate, advising and guiding them to sound financial and personal decisions on purchasing of homes and investment properties. Barry has served on the Board for the past 4 years as the At-Large/Marketing representative. Kelli and her family have been members of Windyrush for three years. She has lived in Charlotte for 16 years, working as an Ultra High Net-Worth Relationship Consultant with Vanguard since her move. She is originally from Bluefield, Virginia-Virginia’s tallest town, and still enjoys spending time in the mountains. When she isn’t cheering on her boys in sports (baseball, basketball, soccer and swim team) she loves to travel. The most recent trip this summer was to Iceland (pictured above). She also enjoys spending time listening to live music, doing crafts and volunteering at Forest Hill Church South Park. They enjoy time at the pool every weekend they are in town during the summer and all of the social activities we have to offer. For the coming year Kelli’s goals are to strengthen some of the year-round social activities we’ve hosted (4th celebration, bike parade, EOY school celebration, movie nights, adult-only live music) and continue to look at new ways to keep our community involved and active. Mike Waleski, and wife Josey have been members of Windyrush for 9 years. They have a daughter Porter (10) and son Charlie (2). Mike is a native Charlottean! He is Director of Sales for Ryder Transportation. His hobbies and interests are sports, traveling, spending time with family, and playing tennis. As a family Porter plays tennis and is on the Dolphin swim and dive teams. Josey and Mike enjoy playing on the tennis teams and hanging out at the pool with friends. Mike’s goals for the coming year is to be a part of the growth and expansion of Windyrush that has been going on over the last 7 or so years. More specifically he would like to help continue to grow our tennis program for children and adults. We have a lot of members that don’t utilize our wonderful facilities. He looks forward to growing the tennis programs at Windyrush.